240 Moo 5 Beach Rd. Located on the 19th and 20th floors of the Ocean Tower, the Horizon Club offers a host of exclusive privileges and amenities for most experienced and most demanding business executives. The hotel has two swimming pools - one freeform and one lap pool, both including jacuzzis. The gardens and sunbathing terraces are the perfect spot to unwind from a busy day. The freestanding conference facility 'Aranda Ballroom,' business centres, breakout meeting rooms and access to video conferencing services also impress the business traveller. Amari Orchid Resort & Tower offers superbly appointed guest rooms and suites with excellent facilities and friendly service. With 297 spacious contemporary guest rooms, the brand new 5-star Ocean Tower offers luxurious accommodation options, including Ocean Deluxe Rooms, Family Rooms, Junior Suites, Executive Ocean Deluxe Rooms, Duplex Suites and Executive Ocean Suites, all with stunning views of Pattaya Bay. The rooms are complete with a unique open bathroom design, providing a light and airy feel, coupled with modern elegance. The 232 comfortable guest rooms and suites have spacious interiors and are tastefully furnished and decorated with bright local fabrics. 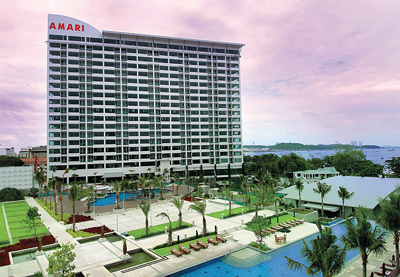 The guest rooms boast colourful views of either scenic Pattaya Bay or the vivid colours of the exotic landscaped gardens. With the hottest concept in dining, Mantra Restaurant & Bar serves mouthwatering Asian and Mediterranean cuisine, in a stylish modern setting. Highlights include tandoori, fresh from the oven and sushi that is prepared as you watch at the sushi bar. Take a break with a great selection of cocktails and snacks and enjoy live jazz by the American Jazz Diva—Ruby Hayes . With an eclectic d?cor, ICE is a great place to socialise and listen to cool sounds. A perfect dining spot, the Essence Restaurant offers a wonderful choice of superb international cuisine , in a relaxing and friendly atmosphere. Set on the Beach Road, Henry J. Bean’s Bar & Grill is a great place to enjoy a selection of delicious steaks, burgers and salads, and unwind with live music. This vibrant restaurant offers a huge selection of cold beer, cocktails and soft drinks. With its light and airy setting, the Orchid Terrace is a wonderful spot to enjoy a hearty buffet breakfast. The restaurant also offers all-day dining, with a mix of delicious menu options. The stylish Lobby Bar offers an extensive range of drinks and snacks, providing a perfect setting to enjoy intimate conversation. Guests can enjoy live piano music from 19:00 to 24:00, Monday-Saturday. Laze on a sunlounger and relax by your choice of two pools, with refreshing tropical drinks and snacks from the Pool Bar.